Some members of a team that have been involved in consultations relating to 10 points of Christian consensus. 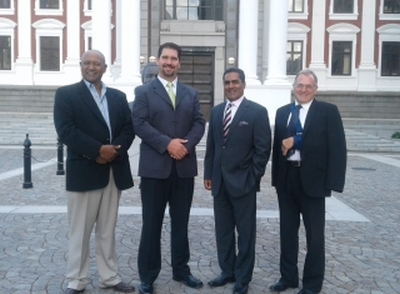 They are, from the left, Dr Ruben Richards , Dr Arno van Niekerk, Errol Naidoo and Advocate Alan Nelson. A great awakening of God’s people is taking place in South Africa, say a team of Christian leaders who have been working together on a strategy to “storm the elections peacefully to usher in a righteous government”. At the heart of their campaign are 10 “Christian Consensus” statements which they say represent what Christians want for SA and which have been endorsed by about a million believers over just a few weeks, and shared with political party leaders as the proposed basis of an election alliance. Several high-profile events aimed at raising awareness of the initiative and mobilising Christian voters, are lined up between now and the election on May 8 (or thereafter), starting with a gathering of senior Christian leaders in Pretoria on Saturday to sign a declaration to officially make SA a Kingdom nation, says Dr Arno van Niekerk, one of the team members. The righteous government election initiative is backed by a major prayer movement co-ordinated by Bible teacher Dr Arthur Frost, who told Gateway News today that Christians responding to a campaign to pray blessings over towns and cities of SA have covered 1 122 locations and are targeting a further out of a total of 3 010 locations. An interactive map and table tracking progress in this campaign will be posted on the website www.greatawakeningsa.co.za, he said. He said there were “thousands, if not hundreds of thousands of people”, praying for the Christian leaders’ declaration-signing event in Pretoria on Saturday. He said a call has been made for intercessors to gather at the venue at Doxa Deo Church in Brooklyn from 11.30am to pray for the event which starts at 1pm. The election initiative began in late January when 200 Christian leaders were asked to list the top 10 values they would want to see implemented if a Christian government was elected. Most of the leaders identified the same values, which became the Christian Consensus that was shared with SA Christians and with political party leaders in meetings at Parliament and at Galagher Estate. The election initiative team meets with political party leaders at Parliament. Every political party was invited to meet with the righteous government initiative team, provided that they were in agreement with the Christian Consensus points, said Van Niekerk, emphasising that the campaign was not about political parties but about uniting and activating the Church across every line of division. “We have prayed at the It’s Time and other events and we have sought the Lord’s face and seen that He wants his people to put their faith into practical action,” he said, referring to Isaiah 59:14 – 16 which speaks about a lack of justice and righteousness because there was no one to intervene. 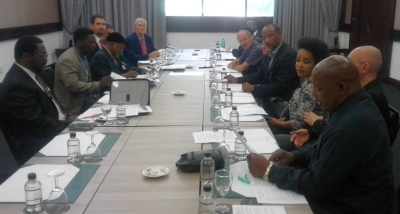 Party leaders who have met with the righteous government initiative team members include Dr Kenneth Meshoe (ACDP), Mmusi Maimane (DA), Mosiuoa Lekota (Cope), Pieter Groenewald (FF) and a representative of IFP standing in for Mangosuthu Buthelezi. He said that in the event of an election victory, alliance partners were committed to putting a righteous president into office, appointing leaders who were accountable to voters, healing the nation and building a prosperous South Africa. The election focus was just the beginning of the initiative, with the goal of electing a righteous government. Thereafter the focus would be on Christians taking hands to make South Africa a righteous nation, he said. Saturday April 6: Christian leaders unite at Doxa Deo Church, Brooklyn, Pretoria at 1pm to sign a declaration to officially make SA a Kingdom nation. Among the leaders invited are Angus Buchan and Advocate Thuli Madonsela. All are welcome to attend. Saturday April 20: A prayer meeting in Johannesburg at a venue to be confirmed, where political party leaders and other leaders will intercede for SA. The public event over the Easter weekend will not be a political gathering but strictly a prayer meeting. Saturday April 27 (Freedom Day): Christians will be asked to wear white and take to the streets for #JesusMarches all over SA — big or small. The Christian awakening team are calling it “True Freedom Day” as they aim to bring a massive shift in the nation. A mass meeting will take place at Mount Zion, Germiston. Everyone is welcome. Wednesday May 8 (Election day): Christians are asked to wear white at the polls. “Seeing each other in the rows to vote, we’ll pray together. A new nation is birthed (Isaiah 66:8),” say the initiative team. How great is our God.so exited to see His work completed. That the darkness shall flee..
Haleluja! Ons bid en verklaar God se heerskappy oor Suid Afrika en die wereld! We REJOICE WITH JERUSALEM! 2 Cron 7:1-2,2,Cron 7:14-18. Why was ACO not present???? I believe Dr Baloyi met separately with a member of the initiative team. I was at that meeting, but was disappointed about the ignorant inclusion of Crossing Lion Gate Group from Jimmy Wright as unrighteousness reign in all their activities. A group due for closing down. I was there at the meeting, Trust in God for the elections to approve your own mandates, after the election we will see what is the plan of God. Voters will be educated by a Covenant mandate, not by preliminary agreements with unrighteous people. AMEN EN AMEN AMEN HALLELUJA! Yoooooooo Hooooo! Thank you so much for obeying God and launching this. May all who still sleep be awakend by the roaring of the Lion of Righteousness Peace and joy in the Holy Ghost! Our country is beautiful. Let’s pray united for peace and forgiveness and God’s favor. I am so excited about this initiative and at our church we are upholding all the leaders in prayer. Our God is an awesome God. Is it possible to have the above script in the other 10 official languages, particularly in Zulu. Nothing will reach the grassroots people of this country like this initiative, if it was in their mother tongue. Amen Psalm 133 God for All and All For God! Ex 30:25,30 YoooooHooooo! Amen God with Us, who can be agains Us. YOOOOOOOOHOOOOOOOOO! Waar kan ons wit ACDP hemde te koop kry. Ek in Klerksdorp? AMEN EN AMEN AMEN HALLELUJA! Yoooooooo Hooooo!Dont Call jacquiPlease True God Almighty Help Me, I Am in You, U Is My Veilige Vesting, Vreeslik sal dit wees om te val in die hande van ñ Lewende God…Probeer om aan my of my kinders te raak, Ek Vra Die Vuur Van Geregtigheid om julle te Verteer. Belei en erken dat God God is of sterf die ewige dood. Jy Is Oorwin Satan! WANT GOD SÊ SO EN AL SY WARE KINDERS SÊ AMEN! Call Jacqui on this no: 084 440 4804 and ask her for assistance. Will the political parties who are prepared to form an alliance be prepared to change their party policy to align with the ten points of consensus? Ek bid eerbiedig saam ..baie hard…met..groot verwagting. Thankyou everyone for arranging this – I am praying and we trust our mighty God together!! Just what S.A. need, where God is in controle. Where two or three agree, it will be done. Thank you Lord you are bringing the true church together. The Word declares that God’s ears are attentive to the prayers of the righteous….We, as believers, need to remember aswell that Jesus is praying for us(the true church) to be overcomers and to walk in Victory daily, not allowing a spirit of fear to emerge or to be entertained….our Faith needs to swell with this incredible knowledge of truth, that if God is for us who can stand against us….I personally salute those upfront, taking on the status quo and pray earnestly that the mighty spirit and the divine power of God, will break whatever is standing before us believers, and also to see and experience God’s supernatural spirit working powerfully to convict more and more sinners to repentance…. I pray that these spokesperson for Christ, would be fully submitted to the Holy Spirits leading, which is all the wisdom they truly need, in the communications with the present powers that be….. We pray for strength of heart and mind and a unity of love amongst these brothers… we backing you in pray all the way…. We desire nothing less than a Godly government fully submitted to the Word and Spirit of Almighty God. I praise and thank our Lord for this incredible initiative and the Great Awakening of the Church! Thank you to all the leaders who are working so tirelessly to bring about positive change in our beautiful country. It is truly appreciated. GOD is truely at work…PRAISE HIS NAME! So thankfull for your iniciative! You are an inspiration to our believers! May God richly bless all this initiative to save this country and to expand His kingdom! Wow wow we bless the Lord for the change that is coming. So exciting…”Lord bless the initiatives of your children”. I stand in agreement with every prayer made for elections. Amen. Jesus said: “ you have not because you ask not”.. shall we ask with more seriousness,now? Almighty God,hear our prayer and let our cry come unto Thee. You are Alpha and Omega, Beginning and the Ending. El SHADDAI ADONAI, the Lord Almighty is Your Name. Yahweh!! 1Kings 11:1-11,Deut17:17,1Kings 9:6-9,1Kings 6-9,1Kings 11:1-6.Deut 17:17-20 Amen! It is Time Thankyou. I pray. Ps116:1 I love the Lord because He hears my voice and my prayer for mercy. 2 Because He bends down to listen, I will pray as long as I have breath! Amen and Thanks for Coming in Agreement. LOVE Zech 8:23 Yooohoooo! It’ll be good if áll biblical christian leaders of áll churches could stand together with this initiative, signing together the document in question in évery supburb in évery town. Although áll church leaders can stand together in this, why is only sóme places like Pretoria in question where people can get together to pray? It’ll be good if áll leaders can come together at their different locations. Thank you Lord for Your blessing on our whole country! Amen! Great to be part of this. Thank you Lord. The Word says; “Put your trust in Me,and I will get the job, done”.Thankyou Jesus! For many years our eyes were fixated on what the enemy was doing instead of fixing our eyes on God as the Author and Finisher of our faith. In 2014 I had a vision of people moving from North to the middle of South Africa carrying piles of wood. The same came from the East and West to the gathering where there was a a type of bonfire already going up. The people whom were already there were praying and singing songs of praise & worship so the fire kept brightening up the night sky while the embers were floating upwards and b3ing blown to places starting more smaller fires where the embers rested.As the people came close to fire they loaded the wood onto the fire they were carrying increasing the power of the fire. More embers rose upwards and were carried by the wind to other places. It is happening. Our God is by His Spirit awakening our nation in a revival of committing hearts to seek righteousness. For this is His Kingdom, righteousness, joy and peace in the Holy Spirit. Hence the name which flowed out of the vision. Fire Igniters SA. “It takes one Holy Spirit inspired man/woman of God to ignite a fire and set a nation on fire for God.” Our people are with you all and we shalp not cease to thank Our Heavenly Father God for all of the leaders now involved who have declared;” South Africa and all her towns, cities, farms. smallholdings, rural areas belong to God. Fire Power Prayer Warriors. Thank you for sharing that. May we all purposely go out and trust the Holy Spirit to start fires and cause our Nation to be on Fire for Christ. Praise the Lord! Thankful that He is moving in SA! Only concerned about the Constitutions of some of these “Christian” parties! Please choose life..what about the abortion policy? It’s MURDER! Aco Covenant is according to the Law of the Lord acceptable! May the Name Of God be Gloryfied. Let’s us keep praying for God’s intervention. We serve an awesome God. With Him ALL THINGS ARE POSSIBLE! We thank God for this great awakening of the church. May God continue to bless you brothers for this great awakening. Is. 60:1 “Arise and shine for your light has come” Christians are now arising to fulfill their mandate of bringing Christ, the Light to reign in our dear South Africa. We believe that South Africa will now be a God fearing Kingdom Nation! Amen and Thanks for Coming in Agreement. LOVE Zech 8:23 Yooohoooo!Amen! Ek bid dat die leiers wat saamkom onder die leiding van die Heilige Gees hulle aan God en aan mekaar sal onderwerp. Mag daar geen eiegeregtigheid wees nie maar nederigheid om saam as een liggaam vorentoe te beweeg. Ons staan en bid saam om die vuur wat aangesteek word hoog te laat brand! Dankie Jesus!! Wow ek is net so opgewonde oor ons land en die mense…. Wat n ‘awesome’ nasie gaan ons nie wees wanneer ons ons knie buig en ons harte weer rig na Abba Vader ni. God het belowe dat as ons terugdraai na Hom toe, Hy ons sal verhoor. Alle eer aan Hom! From Egypt to Canaan. We are entering into our promised land of true freedom in the name of Jesus Christ . SA will become a true rainbow nations as the Rainbow around the throne of God, so we as a nation will by the grace of God will become a nations that seek the face of God by coming boldly to the Throne of grace that we may obtain mercy and find grace in the time of need.Grace teaches us to deny ungodliness…looking for that blessed hope and glorious appearing of the great God and our Savior Jesus Christ.How awesome when He return, He will return to a righteous nations .Alleluia …Alleluia Revelation19 SOUTH AFRICA ARISE ,SHINE for YOUR LIGHT has come and the glory of God has RISEN upon YOU!!! There are many prophecies over our nation. The fire will spread from the Cape all over Africa. Africa will no longer the dark continent but the continent of Light. Amen and Thanks for Coming in Agreement. LOVE Zech 8:23 Yooohoooo!Amen!Amen! 1. Has the DA officially changed its attitude on abortion, and their support of the ANC’s anti-Israel rhetoric? 2. Unless the article I saw recently was wrong,it is my considered opinion that Errol Naidoo owes the ACDP members an apology for the unethical and undemocratic way in which he tried to high-jack the leadership of the ACDP. Ushering in a righteous government in SA is what we are praying for but let’s decide from the outset that we shall not tolerate anti-Biblical actions, especially not from people in prominent positions. Amen. Two good questions. I hope however remains in the Lord. God is the blessed controller of all things. Thank you Father for the change Amen! The church is not a building nor is it a denomination. The church is the believers in our Lord Jesus Christ. Let us now stand together as “The Church” and pray for the change that is needed this our country and that the leaders will stand firm together. Halleluja! Alle eer aan ons Vader. S.A. vir Jesus! I’m very excited and I pray for a shake in the atmosphere on the day of the elections2019.I pray people will lead this country in Jesus name.Lion of Juda. Wonderful initiative! Can you please explain to me how signing this 10 Christian Consensus will impact the situation during and after the election…: Will these parties form a coalition or how do you intend to get a victory? Can you please explain to me how signing this 10 Christian Consensus will impact the situation during and after the election…: Will these parties form a coalition or how do you intend to get a victory? The church is not a building nor is it a denomination. The Church is the believers in our Lord Jesus Christ. Now let “The Church” stand together and pray for the changes that are needed in this our beautiful country. Saam sal ons Bid en Glo. Ons weet dat ons kan Glo aan Sy Beloftes vir ons. God is large and in charge and has never failed us yet! T Him e the glory forever and ever! What will it take for us Christians to stand up in peace and harmony and change the direction of our country into a space where we all can live in acceptance, peace, understanding, love and harmony???? God is great! Dit is fantaties wat julle doen. Dit is on land se enigste redding. Ons moet terug keer na agod, want net Hy kan ons land red van ondergang. I would like South Africa. And then the whole world to turn back to YAHWEH ABBA. Onse Here Jesus Christus, U het vir ALMAL aan die Kruis gesterf, MAAR ons moet dit aanvaar en ons knie buig voor Hom wat Lewe gee. SA is a rainbow nation, meaning God foreknew about it and prepared it for the peace of Jesus. All evil is being arrested by the Fire Holy Spirit, and no one can stand against God’s plan for SA. Amen. Shalom. Father G-d let Your will be done in South Africa as it is in heaven! Forgive our sins as we have forgiven others.All glory and honour to Your name! Grote God! Aan U alleen kom toe al die lof en eer en aanbidding. Die mens wik, maar God beskik! Kom Suid-Afrika! …. Draai na God toe!! Excellent work done we need to change the government and put in God fearing people into parliament to restore SA to be right with God. Thank You Father, for all Your Blessings! Zephaniah 3:17 “The LORD your GODis in the midst of you, a Mighty One, a Savior! He will rejoice over you with joy;… He will exalt over you with singing. “Hy is die beeld vd onsienlike God, die eersgeborene vd hele skepping; Want in Hom is alle dinge geskape wat in die hemele en op die aarde is,wat sienlik en onsienlik is, trone sowel as heerskappye en owerhede en magte – alle dinge is deur Hom en tot Hom geskape. Hy is voor alle dinge, en in Hom hou alle dinge stand”. Kol.15-17. Dit is tot hierdie grote God, ons Vader tot wie ons nou nader in ons gebede,Christus IN ons! Most wonderful news. High time for change. God bless our land and restore sanity in this madness. Dankie Almagtige God, ons Hemelse Vader, vir wat U besig is om in ons land te doen. Dankie vir ons land wat regeer gaan word deur die persoon wat U uitgekies het. U IS IN BEHEER EN ONS PRYS EN LOOF U TOT IN EWIGHEID!!!!!! Ek sien met groot verwagting uit na die verandering wat ABBA Vader in Suid- Afrika gaan meebring. Die gebed van die regverdige het groot krag. Hoog tyd dat ons as Christene wat as dissipels van Jesus Gods Koninkryk sigbaar moet maak dit ook op al die vlakke van die samelewing sal doen. Dat ons kan help om heel te maak wat stukkend is. Soos Jesus dit gedoen het. Amen. Amen… Let da Wil of God prevail… We pray for God’s supernatural Breakthrough for South African…. . As we stand in unity.. We Beleive in our prayer answering God. A religious government is the very last thing we need. Baie opgewonde en bid saam Vir eenheid onder Alle christene. Pets die Here! Dankie Here ons Vader. Laat psalm 85:9-14 ons toekoms wees. Mag u altyd oor ons regeer. Ons koning en ons God. Dankie Vader dat u ons red. Laat Psalm 85:9-14 ons toekoms wees. I raise a HALLELUJA! !What a wonderful God we serve. The Name above all names!Let us be one in God and encourage one another to shine the light to the world! AMEN!!! We serve a Wonderful and a Mighty God. He will not forsake us. All glory to the King of kings. Amen. Praise our Father in heaven for He is indeed able to overcome and bring restoration in our beautiful land. God has answered my prayer. It is high time that we pray for our country in one according. Victory is certain-not by power not by might but by His Spirit and it shall not be otherwise. God bless you men of God. So many times in my life I hit a brick wall or a dead end in my road and I had no way further. Everytime I inexperienced an outcome. Be sensitive to these outcomes in your lives. It is not by luck or by coincidence, it is by God. That is what is going to happen again during and after this election. All honour and praise be to God. God’s Word is the same yesterday, today and forever. Wonderful news,asGod sd, “If my people would humble themselves and pray…. JESUS CHRIST IS OUR ONLY HOPE!!! Looking forward with great expectation to see how He make Ps85:20-14 alive in South Africa! Wow! Wow! Let Your Holy fire rain down Father. If My people who are called by My Name will humble themselves and pray, only then will I hear from heaven forgive their sins and heal their land… This is what’s happening! All praise and glory belongs to You Lord. Amen. Ons aanbid n Almagtige God en Vader. Se al klaar dankie vir die omdraai in ons land. God is Almagtig. In the midst of a seemingly serious storm were are facing in our beautiful country, it’s comforting to know that Christian leaders are uniting in prayer and action to seek God’s will for this nation, so that we can build a future for all citizens of SA with our Heavenly Father as our foundation. We continue to pray for a spiritual revival and for leaders who are God-fearing, honerst in service and leaders of integrity. Soon our continent of Africa wont be referred to as the Dark continent. Gods light with shine here. It will be a beacon of light and hope for others. Praise God! 8 May,election day is so significant regarding this great awakening of all believers in Christ, no. 8 is a new beginning. The number 8 is very significant such that it is used 73 times in the Bible. It is the symbol of Resurrection and Regeneration. In Bible numerology, 8 means new beginning; it denotes “a new order or creation, and man’s true ‘born again’ event when he is resurrected from the dead into eternal life.”Hallelujah! We will raise a hallelujah and trust God Almighty!! Thank you for godly intervention! Christ’s kingdom is not of this world. Our goal should not be to capture the government but to spread the gospel. Let us hope in our heavenly citizenship. In South Africa’s darkest hour. It is time to experience God’s brightest light. Starting in +- 1902, Father God has released 100s of Words that He will cause a worldwide endtime revival, starting from CapeTown, by His firstborn Son Jesus & His Holy Spirit of truth in His surrendered people. Now its time, & we decree He exposes, nullifies & destroys EVERY word, plan & work of His enemy the liar towards & in SA, and brings to pass His Kingdom-rule in & through us in these day, amen. Faith without action is dead. Christians must unite at all times. GOD our living GOD, I AM what I AM is in control…through HIS SON, JESUS CHRIST our Saviour, Redeemer, Righteousness and Healer will through His HOLY SPIRIT work all things together for our best and HIS glory!! We pray and believe and ask THY will be done on earth as it is in Heaven. We pray that GOD Almighty must keep your team on the go, that HIS glory must shine upon you and HIS Love abides with you all the time. GOD BLESS YOU IN JESUS NAME. Thank you Father God for truly You have stirred this Nation to lift up your name. The unity that the Holy Spirit has brought amongst believers is so beautiful and exciting. And Daniel thank you for sharing your vision in 2014……the fires are burning across our precious country. We shall not stop praying. Amen, our God is an awesome God He will not leave us nor forsake us, he is in control of our beloved country South Africa. Thank you for listening to the voice of God and being obedient to His call. We stand together with Victory.Thy perfect Will be done. 1 Now, brothers and sisters, about times and dates we do not need to write to you, 2 for you know very well that the day of the Lord will come like a thief in the night. 3 While people are saying, “Peace and safety,” destruction will come on them suddenly, as labor pains on a pregnant woman, and they will not escape. 4 But you, brothers and sisters, are not in darkness so that this day should surprise you like a thief. 5 You are all children of the light and children of the day. We do not belong to the night or to the darkness. 6 So then, let us not be like others, who are asleep, but let us be awake and sober. 7 For those who sleep, sleep at night, and those who get drunk, get drunk at night. 8 But since we belong to the day, let us be sober, putting on faith and love as a breastplate, and the hope of salvation as a helmet. 9 For God did not appoint us to suffer wrath but to receive salvation through our Lord Jesus Christ. 10 He died for us so that, whether we are awake or asleep, we may live together with him. 11 Therefore encourage one another and build each other up, just as in fact you are doing. True, we need to b careful of conspiracies against our beloved country. We need to have spirit of discernment, hv ability to distinguish between what’s real Christianity and not. We have to be careful of those who are just power hungry and not really hv interest of the nation at heart. We need to put God in charge of the elections, not human, cos once others are in power, the whole thing will change, back to where we were in Egypt, we don’t want to go back by God’s grace, which is sufficient for all, He is in charge, no matter what the enemy wants or plans, it won’t succeed. We are more than conquerers, as He said in His Word. Real Christians will thank God for the beautiful country and da peace that we have. Once again dear true Christians b warned of those who claim to be godly just to be in power. Let’s allow The Holy Spirit to give us the spirit of wisdom, spirit of discernment during this end days. Remember that Jesus Christ is coming back, so we need to b holy, to live by God’s commandments. Bly bid vir diegene wat vandag geteken het. Prys die Here ons almagtige God! Dis jammer dat dinge so ver moes gaan voor ons saamstaan om God se aangesig soek maar ja; dis ons antwoord op al ons probleme. Gelukkig is dit nooit te laat nie. God is groot!!! It is time for change. Praise God for a righteous nation. God is in control and we thank Him for those leaders and parties involved in praying for change. God is ever faithful. May His promises for our country ring true as He leads us all in this time of gathering and prayer. Never before have I seen such a fantastic response to an article posted by this truly God inspired newsline. This is evidence that the prayer of so many Christians who for a while have been earnestly praying for unity in the Body as well as revival in the hearts of the Body … has in fact been heard and is being answered by our Almighty Creator God… we must keep on praying… seeking His face… repenting of our sins… He is going to heal our land. Of that there is no doubt. Blessings to all. So as Chfistuans in unity, who do we vote for? Who is the righteous party? This is absolutely wonderful news. God bless South Africa. Hear the sound of the Lion of Juda, see the fire and the fear in the enemys camp.. For the sound of the Lion of Juda.. Hes roaring again! Theres a new generation rising, a nameless, faceless, placeless tribe.. All they fear is the fear if the Lord.. All they hear is the Lion… Hes roaring, Hes roaring again!!!!! I praise God for our precious rainbow nation, every tongue and tribe. God bless you all my brothers and sisters in Christ! Ps34:15,17 Pr29:2 When the righteous are in authority,the people rejoice:but when the wicked beareth rule,the people mourn!! Wonderlike inisiatief! Ek dink nie daar is al ooit soveel vir hierdie land gebid as nou nie. Ons hoop op die Here. United we stand to serve an awesome God! All glory to God for those taking the initiative to get the body of Christ standing and praying in unity to see His will being done in SA! I trust the Lord that this will ignite the Church in the rest of Africa to do the same. I’m especially excited about God’s love alive in us, that’s becoming so visible in this beautiful Nation! Amen! Ek is so opgewonde om te sien wat die HERE gaan doen in ons mooi land, en bid dat sy kinders die regte esluite haan neem volgens Sy will. Ons as Christene get n groot verantwoordelikheid OP ons om te sorg dat ons stem om in n land te woon wat die Christelike geloof uitleef. Yes amen for a christian goverment. I believe our God is in control. He will expose the real organisers behind the Alex protest. We serve an awesome God! God is ons Redder! Hy sal regeer. Dankie dat julle opstaan! South Africa back to God. I believe, we are a Christian State but not a circular state with about 85% Christians. Dr Sipho Xipu Deputy President of the Christian Political Movement (CPM ). Let’s b careful of conspiracies amo gst those who call themselves Christians just to get to power then after being put into power get back to their old cruel ways. Real Christians shall pray for The Almighty God to b in charge of the elections and all processes involved thereof. Some Christians are power hungry, that’s very evident in their comments. God’s love for SA will never end if we trust and hv faith in Him, not in people. So true Christians ask God to give u the spirit of discernment, to b able to distinguish between real and unreal talks or issues. Use the God given spirit of discernment b4 being deceived by power hungry individuals. Wonderful initiative. Thank you …. you all shall be in our prayers. If Christians stood united on key issues in this land – The Lord Our God will bless us with His favour, but it is so sad that we look at things in isolation & vote for political parties that suit our own needs – they tick a few boxes… but do they stand for truth & upholding moral teaching? 𝑾𝒉𝒆𝒓𝒆 𝒅𝒐 𝑨𝑳𝑳 𝒐𝒖𝒓 𝑪𝒉𝒓𝒊𝒔𝒕𝒊𝒂𝒏 𝒄𝒐𝒎𝒎𝒖𝒏𝒊𝒕𝒊𝒆𝒔 𝒔𝒕𝒂𝒏𝒅 𝒐𝒏 𝒕𝒉𝒆 𝒕𝒐𝒑𝒊𝒄 𝒐𝒇 𝑨𝑩𝑶𝑹𝑻𝑰𝑶𝑵 𝒊𝒏 𝒕𝒉𝒊𝒔 𝒍𝒂𝒏𝒅? From the moment of conception The Lord Our God has breathed life – a babies heart beats at 18 days old. 𝐀𝐭 𝐍𝐎 𝐭𝐢𝐦𝐞 𝐢𝐬 𝐚𝐛𝐨𝐫𝐭𝐢𝐨𝐧 𝐚𝐜𝐜𝐞𝐩𝐭𝐚𝐛𝐥𝐞. 𝐅𝐨𝐫 𝐮𝐧𝐰𝐚𝐧𝐭𝐞𝐝 𝐩𝐫𝐞𝐠𝐧𝐚𝐧𝐜𝐢𝐞𝐬 – 𝐀𝐝𝐨𝐩𝐭𝐢𝐨𝐧 𝐢𝐬 𝐚 𝐬𝐨𝐥𝐮𝐭𝐢𝐨𝐧. The streets of this land are red with the blood of our defenceless innocent unborn babies murdered in their mother’s womb – can we see a turn around in this country if we don’t change these demonic laws as 𝐀𝐁𝐎𝐑𝐓𝐈𝐎𝐍 𝐈𝐒 𝐓𝐇𝐄 𝐌𝐎𝐃𝐄𝐑𝐍 𝐃𝐀𝐘 𝐇𝐔𝐌𝐀𝐍 𝐒𝐀𝐂𝐑𝐈𝐅𝐈𝐂𝐄 𝐓𝐎 𝐒𝐀𝐓𝐀𝐍. A mother’s womb should be a safe haven for an UNBORN BABY instead it has become a Death Chamber. We cannot be followers of Jesus Christ and vote for political parties that are for the killing of innocent lives – Abortion is not the answer. A𝐬 𝐂𝐡𝐫𝐢𝐬𝐭𝐢𝐚𝐧𝐬 𝐰𝐞 𝐧𝐞𝐞𝐝 𝐭𝐨 𝐬𝐭𝐚𝐧𝐝 𝐮𝐩 𝐟𝐨𝐫 𝐓𝐡𝐞 𝐆𝐨𝐬𝐩𝐞𝐥 𝐨𝐟 𝐋𝐢𝐟𝐞 – 𝐓𝐡𝐞 𝐆𝐨𝐬𝐩𝐞𝐥 𝐨𝐟 𝐉𝐞𝐬𝐮𝐬 𝐂𝐡𝐫𝐢𝐬𝐭. 5 𝑩𝒆𝒇𝒐𝒓𝒆 𝑰 𝒇𝒐𝒓𝒎𝒆𝒅 𝒚𝒐𝒖 𝒊𝒏 𝒕𝒉𝒆 𝒘𝒐𝒎𝒃, 𝑰 𝒌𝒏𝒆𝒘 𝒚𝒐𝒖, 𝒃𝒆𝒇𝒐𝒓𝒆 𝒚𝒐𝒖 𝒘𝒆𝒓𝒆 𝒃𝒐𝒓𝒏 𝑰 𝒔𝒆𝒕 𝒚𝒐𝒖 𝒂𝒑𝒂𝒓𝒕. 30 𝑬𝒗𝒆𝒏 𝒂𝒍𝒍 𝒕𝒉𝒆 𝒉𝒂𝒊𝒓𝒔 𝒐𝒇 𝒚𝒐𝒖𝒓 𝒉𝒆𝒂𝒅 𝒂𝒓𝒆 𝒄𝒐𝒖𝒏𝒕𝒆𝒅. 31 𝑺𝒐 𝒅𝒐 𝒏𝒐𝒕 𝒃𝒆 𝒂𝒇𝒓𝒂𝒊𝒅; 𝒚𝒐𝒖 𝒂𝒓𝒆 𝒘𝒐𝒓𝒕𝒉 𝒎𝒐𝒓𝒆 𝒕𝒉𝒂𝒏 𝒎𝒂𝒏𝒚 𝒔𝒑𝒂𝒓𝒓𝒐𝒘𝒔. I do apologise – the previous message I posted pulls through correctly on a laptop but not on a mobile phone as the bold words etc. are replaced with other characters which is not readable to the reader – the devil is very busy – sorry once again. If Christians stood united on key issues in this land – The Lord Our God will bless us with His favour, but it is so sad that we look at things in isolation & vote for political parties that suit our own needs – they tick a few boxes. Do they stand for truth & upholding moral teaching? Where do ALL our Christian communities stand on the topic of ABORTION in this land? From the moment of conception The Lord Our God has breathed life – a babies heart beats at 18 days old. At NO time is abortion acceptable. For unwanted pregnancies – Adoption is a solution. The streets of this land are red with the blood of our defenceless innocent unborn babies murdered in their mother’s womb – can we see a turn around in this country if we don’t change these demonic laws as ABORTION IS THE MODERN DAY HUMAN SACRIFICE TO SATAN. As Christians we need to stand up for The Gospel of Life – The Gospel of Jesus Christ. 5 Before I formed you in the womb, I knew you, before you were born I set you apart. 30 Even all the hairs of your head are counted. 31 So do not be afraid; you are worth more than many sparrows.